Bill is a Serial Entrepreneur and currently serves as an Advisor, Mentor and Investor in a variety of data and b2b centric early and mid-stage companies. 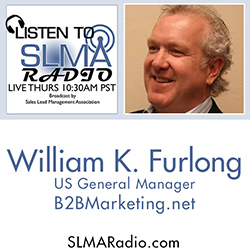 Currently, Bill is working with London based B2B Marketing as their GM of their newly launched USA division. He also invests and advises several b2b startups in New York and Chicago. He is Founder and CEO of SquareStack, a new SMB business applications platform. Before that, he was the SVP/ Business Development, and part of founding team of Bizo, a Business Audience Data Management Platform firm, which was acquired by LinkedIn in 2014. He built Bizo’s publisher network of over 2800 vertical industry websites, and brokered new data service agreements with Fortune 500 companies such as General Electric, Dow Jones, and Time Warner. In late 2014, Bizo was acquired by LinkedIn. A graduate of the University of Illinois at Champaign – Urbana’s College of Communications, he received a B.A. in Communications and minored in Political Science. He remains active in UIUC alumni association activities including the James Webb Young Trustee Board. He guest lectures at the University as well as at DePaul University, Northwestern Medill, and University of Chicago. He is also in the Chicago 16” Softball Hall of Fame, and a Second City Improvisational School Alumni. Specialties:Media, marketing, B2B, publishing, membership, community, resource, training, events.